It’s in 2016 that I started my YouTube channel about living with genital herpes. When someone contracts herpes, chances are (around 80%, to be precise) they won’t have any symptoms and will never experience an outbreak. But when someone gets *diagnosed* with it, the stigma around herpes is likely to hit them hard and mess up their self-confidence virtually every day. Three years into my diagnosis, I realized that I could actually control how much I allowed the stigma to mess with me (that’s a whole other story, it’s here if you’re curious) so I flipped the script, walked out of my self-imposed silence on the topic and started a conversation to break down misconceptions around what a herpes positive looks like, how herpes is contracted and what living with it really entails. To be honest, I’m still in awe of how much fulfillment I get today talking about something that used to make me feel *sooooo* ashamed and subpar! Initially, I started a blog. I was comfortable to publicly share my status, but not enough to be attaching my face and voice to my story. So I blogged for a year - interviewed people, ranted, gave interviews, ranted a bit more but the discoverability of my posts was low and I knew video was the most powerful medium to shatter the stereotypes I was after. The other reason why I knew I had to get on YouTube is because besides being a YouTuber, I am also a brand strategist. And get this: for the couple years prior to starting my channel, the advertising and innovation agency I was working for in NYC had YouTube as a client and this girl had for some reason been assigned to be on that account full time! At times, my job involved watching countless videos of specific YouTube creators and getting to a crystal clear articulation of what was special about their relationship with their audience. From a platform for shallow and silly videos, I gradually discovered YouTube to be a safety net for people who felt alone in tough emotional situations (e.g bullying, coming out, racism) and needing a friendly and relatable face to give them hope that things can get better. And that was exactly what people with herpes needed, a friendly face to snap them out of a society-induced shame and reclaim their own narrative. During his commencement speech at Stanford, Steve Jobs said “You can’t connect the dots looking forward, you can only connect them looking backwards. [...] Believing that the dots will connect down the road will give you the confidence to follow your heart even when it leads you off the well worn path.” It resonated with me as I couldn’t have anticipated that my job and my passion were going to complement each other so neatly but when did they crossed path, it made absolute sense. I approach herpes as if it were one of my clients - needing a rebrand to shed the disproportionate bad rep it has compared to the little harm it actually causes. My background in strategy also helped me understand that the little amount of open conversation around herpes was a sign of opportunity, and the daily messages I get from people finding comfort in my videos are the biggest success I could have hoped for. My coworkers’ awkward faces when stumbling upon my NSFW posts is second to that! Oh and my desk at home is #GOALS! 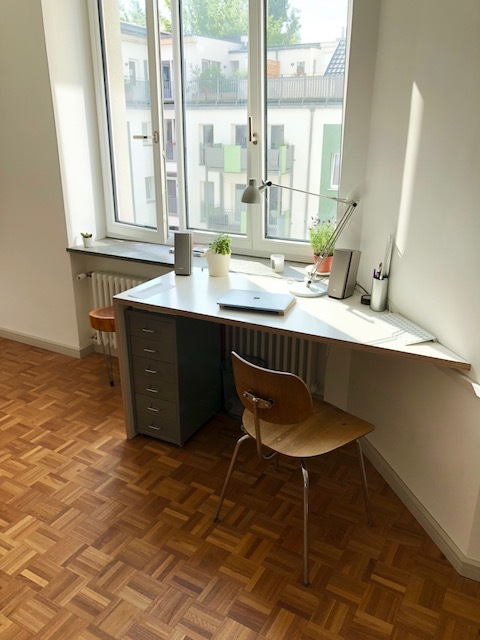 I’m subletting this apartment for the summer but might very much take the desk with me when I find my own. I try to keep things very tidy and neat, as if it were a way to make more room for thoughts and ideas when I script my videos. On the other hand, my desk at work is pretty messy - always has some printed reports, receipts and god knows what else. I like to have everything in handy and minimize interruptions. I’ll let you have a guess on which is which! To learn more about Laureen, you can follow her on Instagram and YouTube.